In an Independent Journal article, a Chick-fil-a in Conroe, Texas has decided to “Back the Blue.” Because the local college (Lone Star College) has colors of blue and white, this not only means that they back the local college, but also that they back law enforcement. 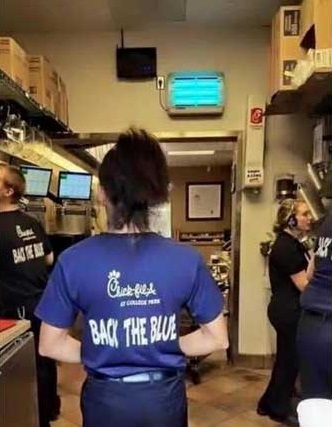 It’s not the first time Chick-fil-A has shown support for their ‘brothers in blue,’ either. In various locations across the U.S., they’ve allowed police to host a ‘story time’ for small children, reportedly suspended sales as a fallen officer’s funeral procession passed by, and – in stores across Utah, the chain hosted fundraisers to support the families of fallen officers.